Hi, my name is Darlene Lim. I am a research scientist at the SETI Institute and the NASA Ames Research Center in Silicon Valley. I am currently leading the Science and DeepWorker submersible activities at the 16th NASA Extreme Environment Mission Operations (NEEMO). I’m a geobiologist and DeepWorker sub pilot by day; mommy, wife, perpetual explorer by day and night! Today is the first day of our submersible operations at NEEMO16. And as is typical for these types of complex deployments, we’re behind schedule, being held up by water on the deck, and other expected unexpected events. I’ve been working with Nuytco DeepWorker submersibles for 5 years now, both in lakes and in the ocean. The first day is always a day for working out the kinks, making sure everything is buttoned down, safe and ready to take a serious work out by our eager Science Pilots. So by extension, the first day is always a little bit of organized chaos. The plan for today (see pic below) is to have Drs. Mike Gernhardt (NASA JSC) and Steve Gittings (NOAA) complete a flight with the submersibles that will take them past the Aquarius Reef Base, a submerged habitat that NASA is currently using for Near Earth Object crew simulation activities. (oh ya, they will be flying the plan in reverse of what is shown – long story, not that interesting to write about) On their way over to the Aquarius region, Mike and Steve will be using the subs to map out geochemical characteristics across Conch Reef, and to observe and correlate these data with broader contextual features such as topography, sediment type, tile fish mounds, barrel sponge presence/absence, among many other things that we will encounter. All of their observations will be captured onto the on-board voice and high-definition video recording system, and ultimately time synchronized with sub tracking data so that we will know where each comment was made and where each section of voice and video was recorded to within sub-meter accuracy. We’ve built up an extensive science matrix to ensure that all of our flights tie into our overarching science objectives, and to maintain a focus on testing hypotheses that the entire science team has provided input on. This matrix is what guides all of our submersible flight planning activities. We will also have a few instruments strapped to our subs – a couple of conductivity, temperature, depth (CTD) sensors, one EXO sonde that will measure CTD, oxygen, chlorophyll and other water properties, and one Canadian made underwater Scene Modeler (uSM) that will provide us with near real-time 3D maps of the coral reef. So you’re probably wondering why NASA would be interested in our work. The answer is this: science is driving our every move, and as such we will be able to learn a great deal about how best to conduct productive science and exploration with humans in hostile environments, such as underwater or in space, in a non-simulated, completely real working environment. The stakes are high – we have grad students who are hungry for data and so failure is not an option. So, as we plan and execute our sub flights here on Conch Reef, all of our planning tools, operational procedures, communications protocols and science data return will be judged and assessed in order to find the best cocktail for science and exploration success. I love doing this kind of work because it taps directly into two of my interests – science and human exploration – and let’s me actively examine the intersection between the two. Well, I’m off to re-engage in the morning’s preparations. I’ve got my fingers crossed that we’ll get the subs in the water this morning once the operational kinks have been all worked out. 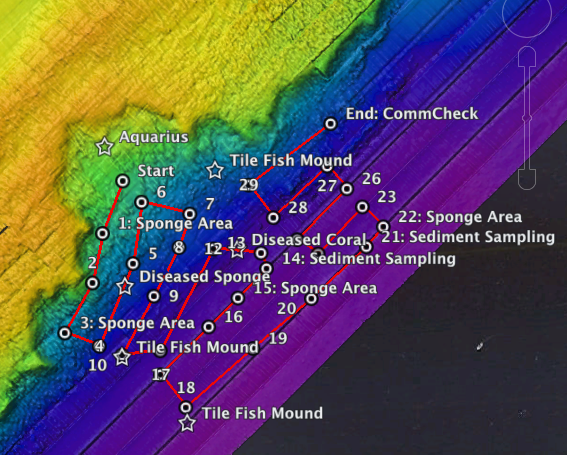 Tune in for more thoughts from the NEEMO 16 field site when you can! I will be here until Saturday, June 16th.